A National Seminar on the “Harmful Effects of Mobile Phone Radiation” organize by the Mobile Phone users Association of Bangladesh was held on 26th January, 2018 in the National Press Club, Dhaka in the Tofazzal Hossain Manik Mia Auditorium. Prof. Dr. Md. Quamruzzaman of ETE department of Daffodil International University (DIU) was the key note speaker. In his valuable speech Prof. Quamruzzaman mentioned that the radiation from Mobile Phone (due to excessive uses) may cause harm to human health as a result they may suffer from various diseases like headache, Insomnia, pain in the ear, body pain, eye sight and memory problem etc. It is also reported from the western world that long term effect may turn into brain tumor and cancer. He urged the public to be careful while using mobile phone. He also said that there is no proper laboratory to measure the SAR value of mobile phone and requested BTRC to set up a properly equipped laboratory in Bangladesh for the safety of general public health specially the young generation. The seminar was presided by Mr. Mohiuddin Ahmed, President, BMPCA. 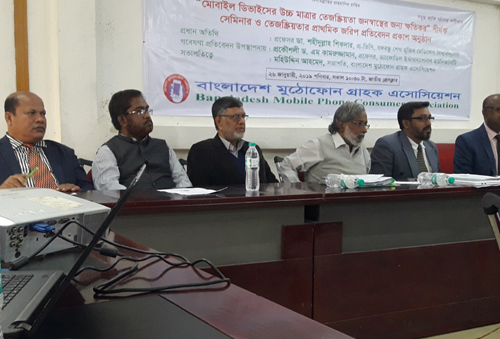 Prof. Dr. Sahidullah Sikdar, Pro-VC BSMMU, was the chief guest and a good number of professors, critics and elites of the society were present in the seminar.